The norm here is my brother read so so and so, then I must do the same. In fact, some students wish to be in the same schools their families had once. I want to go to OAU. Mine is UI! Our family goes UNILAG. This could just be due to some fantasies or shared experiences by their brothers and sisters but in reality, your life doesn’t have to depend on fantasies or a mare Bro. John’s experiences. I chose to write this peace when a graduate member of a group I belong shared something amusing but a REALITY. I had always warned against picking just any course in university, polytechnic or college of education. This is because I’d been there too and I know what really works and what doesn’t. Some courses had worked in the past in this country but they’re now walking dead. Schools are not doing justices by not scraping those courses yet. Perhaps, education is turning to more of the economy now than the original academic motive. It's disheartening to still find several of these courses among the most competitive ones in our schools. I usually say it, “You won’t succeed in life until you learn to understand your weakness and strength”. You’re free once you stop underestimating your weakness and overestimating your strength. This is where most people fail. Why would a poor man’s child chase the same field as the rich’s child? We’re not born equal bro! If you study Political Science in Nigeria, where can you use your certificate? Great for you as a boy or girl from a poor background or rich one? In fact, Political Campaign Staff are usually tugs and drop-outs in this country. Your case is not different if you study courses like Public Administration, International Relation and Diplomatic Studies. They all sound good but where will you be after your graduation dude? 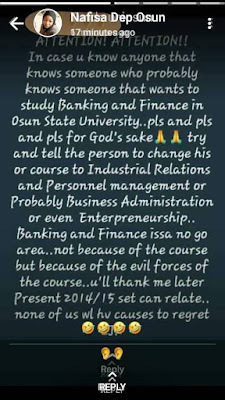 Back to my friend's message to candidates pursuing Banking and Finance. Let’s be frank with ourselves, since you’re born, how many banks were established in your own town? Do you see the end from the beginning? So at the end, it all goes back to Rich man's children. 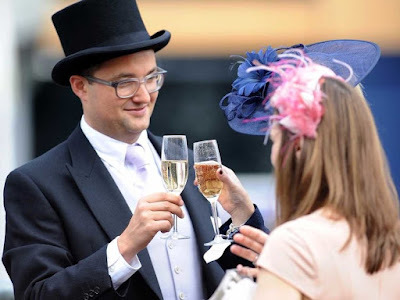 If a rich man's child studies Education Management, Religious Studies, Physical and Health Education and the likes, he can end up working in a bank while you – trained for the job is teaching in a nursery and primary school. Stop chasing other people’s courses. The guy recommended Industrial Relation and Personnel Management and Entrepreneurship and I loved it. Let me add Marketing. 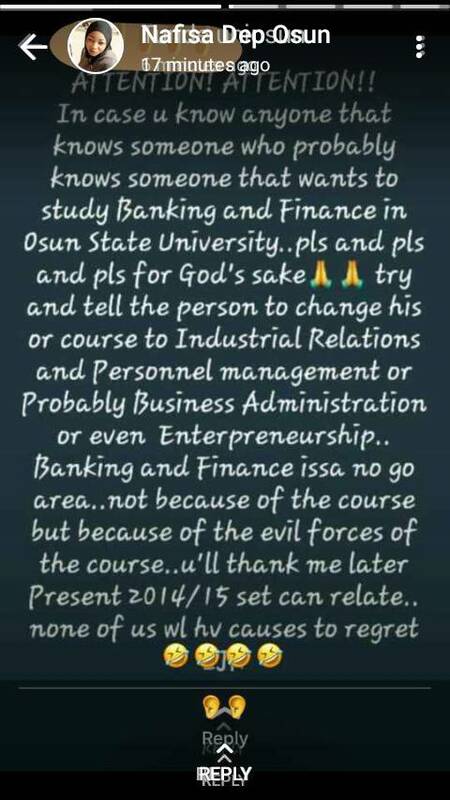 Even if you study Business Management and Accounting in Nigeria without additional professional qualification such as ICAN or second degree (Msc), you will end up like your Banking and Finance counterparts. It’s equally easy to fool yourself that you can start working after your degree. Then you can raise money to go for ICAN later. Here is the thing – It’s easier said than done. Insurance is another one-eyed course people are spending 4 good years to study. At the very end, where is your position? Look across the street; show me that insurance company that may engage you sooner. A country where an average man can’t afford three square meals, how does he pay the insurance premium? So, God ends up favoring a spider who has the web but not the poor fly. If you study IR and PM, as our friend recommended, you end up becoming a human resources manager or manageress of a company. These are the people that recruit staff for their companies. And if you can’t make it to a company, you can start your own agency or consulting business that recruits for companies, government and so on. 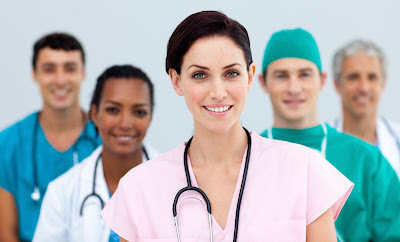 In short, the best advice for you is to go for a course that is not company dependent. Do something that can prepare you to start your own firm or business to leave your dreamed life. I heard the story of a king here. On graduation occasions, he would be invited. While giving out certificates to graduates of Nursing, Medicine and Pharmacy, the old man would murmured to them, “You’re a sure Millionaire”. That's the truth in Nigeria. If you’re from a poor background and your parents are ready to be drained to the maximum, or you don’t care about anything else, or there is a better sponsor somewhere – I recommend going for Sure-Millionaire courses mentioned. Most of the times, when a Nigerian student wants to console himself or herself, you hear "graduate is a graduate". How true is that? Graduate can be graduate really if Government is providing jobs. In this case, hardly will government discriminate between one course and the other or Bsc and HND. But that is not the order of the days. Graduate can be graduate indeed if you can come out with 1st class from a university or Distinction from a polytechnic. That can give you an edge in most competitions of course. But can you? Only the private companies are continually recruiting in Nigeria. Yet these sector only gives priority to the best certificate/grade and additional professional qualifications. Got one? This piece is just an introductory task about this dilemma. I will continually be releasing similar ones to cover larger areas a time sooner. Subscribe to my post for future updates. Many have been victims. I argue we should stop this malacy. We're in charge of our lives. Let the masses know this, let the admission seekers be warned. If our next 80 years or more depends on our choices now, we should make the right ones. Help me get this words across the oceans, share with your contacts on Facebook, Whatsapp and Twitter. Use the share icon below this post for your convenience.